I get so tired of hair help sites whose participants lavish praise on good results, and cover for doctors that produce bad results. This is a clear example of a doctor all prospective FUE patients should know of, and steer clear of. Did I miss the doctors name in one of the responses? Please, do tell. Hopefully the guy had some decent growth there. As bad as it looks at least he can shave it down and it might not be as noticeable. The scary thing is that this is not the worst I have seen, this guy will be fine if he grew his hair 1/4 inch longer in the back. All of a sudden I don’t feel so bad about my strip scar anymore, white bullet shots or long strip scar, pick your poison. » bullet shots or long strip scar, pick your poison. The photos above have the worst scarring I have seen from Fue. Joe posted the photos I believe, I wish he would tell us where these photos came from. I am lucky enough to have a great strip scar, but it still prevents me from shaving my hair short in the back. 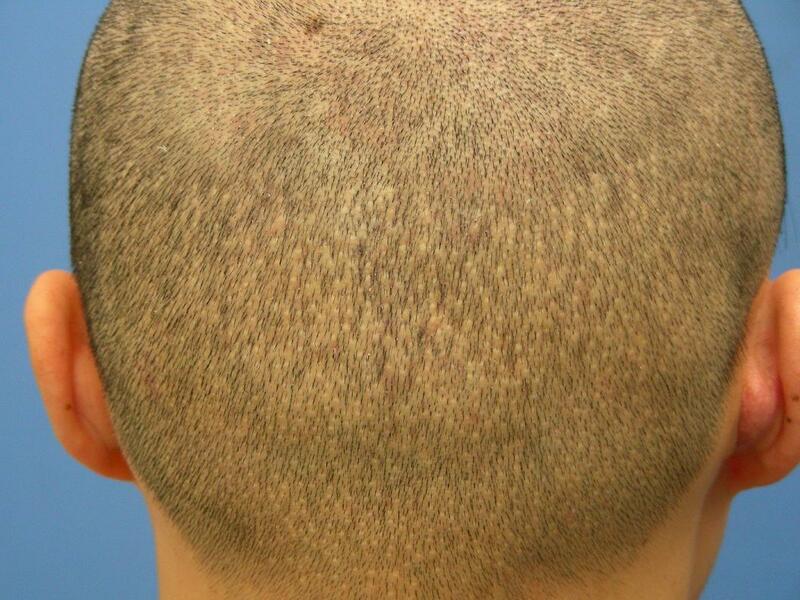 The point is, if performed incorrectly, either strip or fue will have noticeable scarring. But if both surgeries are performed correctly, and results come out as planned, then Fue offers much much less scarring. Fue offers so many more options as far as how short one can wear their hair after a procedure. » » bullet shots or long strip scar, pick your poison. » more options as far as how short one can wear their hair. This is a close up shot of the donor, in real life you are most likely going to see this from a distance and the white dots shouldn’t be as obvious. We are literally examining this up close right here. ANYONE considering Strip surgery should also consider the reality of the complications involved as well as the severity of the scar. Besides being almost temple to temple. This scar looks like it got infected. I think everyone should take in to account when going for any surgery that we all heal differently. 3 people may go into the same surgery and all three peoples results could differ regardless of Doctor doing all three patients, and being a great Dr etc. It would be nice if humans were like cars and we could clone the same result exactly again and again, but we arent at that stage of technology yet. I personally dont think compared to a strip scar this guys donor region if grown out a little is that bad anyway. We will never know anything about this procedure unless the patient comes forward. IMHO the white dots where produced with 0,9 or larger extraction instruments. I dont think this FUE example is representative for good FUE work where smaller instruments are used. That having said, there will always be some sort of evidence of surgery, FUE is not magic. Sir, actually I can say from viewing sofarsogood’s legs, there is no evidence a surgery has been performed. Pull out high magnification, maybe. Not with the naked eye.